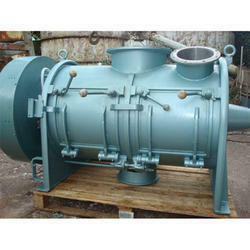 Our product range includes a wide range of automatic plough shear mixer, plough shear ms mixer and plough shear mixer. Plough shear mixer is circular type, each plough blade shaft with one shaft. Plowshare or bevel-cutter is installed on mixer shaft to avoided dead corner when material start to work, such as radial and length wise direction. Material keep turbulent flow way. It is widely used for dry power, particle, low viscosity, paste, power, chemical industry, fine chemistry, fertilizer, pesticide, pharmaceutical, metallurgy, mine, building materials, ceramics, fireproofing, adhesive etc, solid-liquid, solid-thick liquid material mixing. It can be continuous work. Drum type chamber, with fly cutters inside.Material can be mixed equality in short time by fly cutters rotate along with high speed. a. Manual discharging, pneumatic discharging, electric discharging for option. Plough mixer keeps material onflow. Because of high speed and shapes of plough agitator,centrifgal vortex action,material in plough mixer makes three-dimension movement and is mixer together. It can chopper while mixing. The Plough Shear Mixer or blade blenders are based on the mechanical fluidization principle of the materials. The rotation speed creates a swirling motion for a perfect homogenization and a high blending precision.The Plough Shear Mixer is the so-called “aggressive” mixer that provides high shear force to the bulk materials during the mixing operation, with the design of the plough (or plow) shaped agitators. These ploughs with sharp ends can easily penetrate through the dense and thick powder or paste materials. 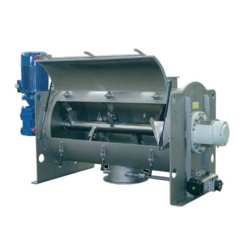 Plough Shear Mixer are so versatile that they are able to treat a broad range of materials as powders, granules, short fibers, moist solids, pasty materials, slurries and viscous masses. During the mixing process, the shaft and those plough-shaped agitators are driven by the geared motor. The special arrangement of the agitators creates intense axial and radial movement of the materials. Usually, the Plough Shear Mixer has a feeding ratio of 50% - 60%, so there is sufficient space for the individual particles to be lifted and fluidized above the material body, and those particles are much easier to get mixed homogeneously and efficiently. After several minutes of mixing, the product is ready and can be discharged from the bottom valve, while the machine is still running. This will avoid any separation or segregation during discharge.